This year we are operating the largest budget QIA has ever had in its history. This budget is a reflection of the growth in our programs and benefits agreements. 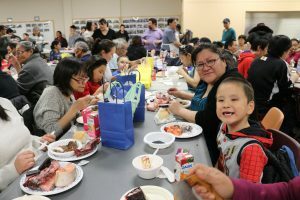 While our meetings were an opportunity for board members and staff to have important discussions about our work and where to go next, we also took the time to celebrate with music, country food and prizes at out community feast. Here are some of the highlights from our meetings. 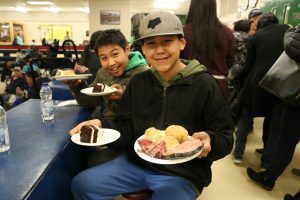 We hosted an incredible feast at Iqaluit’s Inuksuk High School on Tuesday night following our Annual General Meeting. 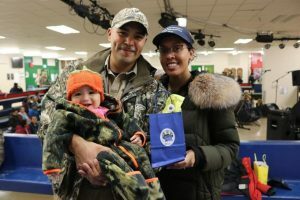 Over 500 people joined us for country food, live music performances by Kamaalukutaat band as well as the adorable kids at Tumikuluit choir. 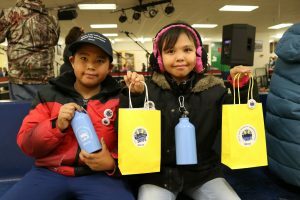 We had amazing door prizes including airline tickets donated by First Air and Canadian North, gas and grocery cards donated by Qikiqtaaluk Corp. (QC) and other great items like a laptop for students and a sewing machine and sealskins. A massive candy-toss capped the night – and everyone went home with full bellies and music on their minds. 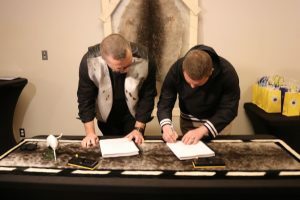 By far our biggest project in 2017-2018 has been our ongoing work on the Tallurutiup Imanga Inuit Impact Benefit Agreement (IIBA). 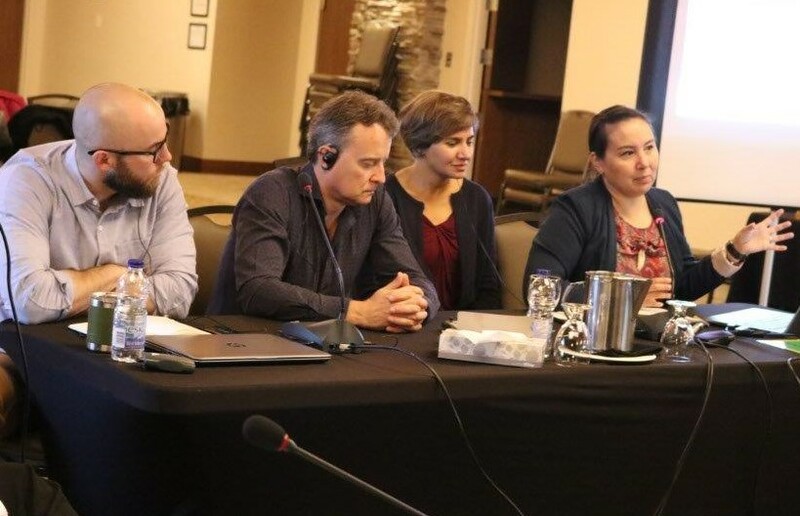 Our IIBA team has had eight meetings with the negotiating team from Parks Canada and our President has had quarterly meetings with Minister McKenna of Environment and Climate Change. 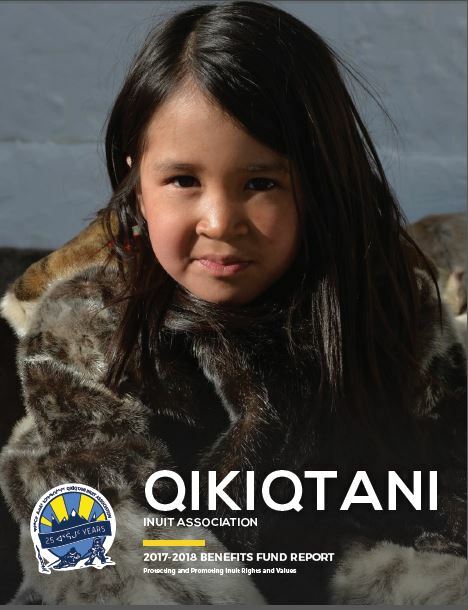 In late July QIA launched our pilot Uattijiit Program in Arctic Bay. This Inuit Stewardship program is being rolled out as we work on negotiating the Tallurutiup Imanga IIBA. 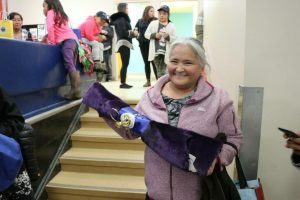 This has meant hiring five Inuit in Arctic Bay for the Uattijiit Program, the goal is to expand this to the rest of the impacted communities upon the completion of the pilot project. 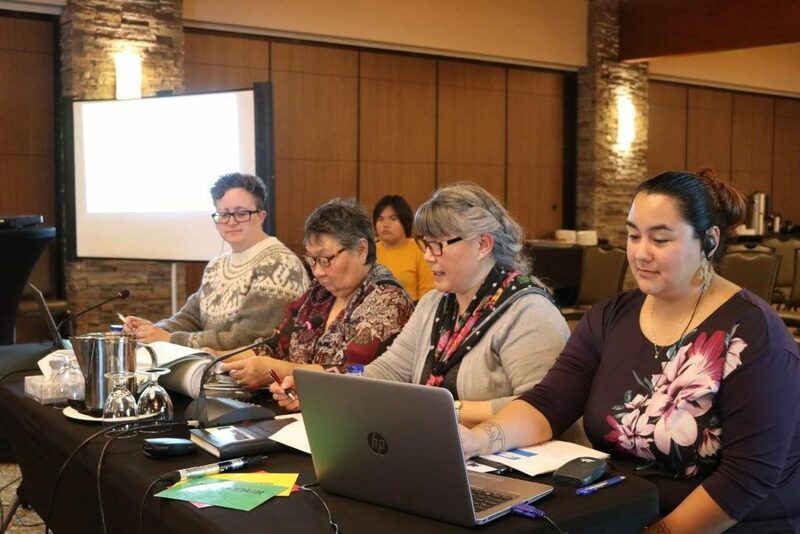 As we work on finalizing the negotiations for the Tallurutiup Imanga IIBA we have also been working in partnership with the Government of Nunavut and Parks Canada to draft the Interim Management Plan for this National Marine Conservation Area. Towards that end, our teams have travelled to all the five Tallurutiup Imanga communities gathering input and providing information on the management plan. Throughout the negotiations, we have continued to demand involvement from multiple federal government departments, besides Parks Canada. In late July we also met with the Prime Minister’s Office to discuss the IIBA negotiations. We are making considerable progress in negotiations and submitted a draft Agreement in Principle to the Government of Canada. The signing of the IIBA is still progressing toward March, 2019 which is an extremely tight deadline. 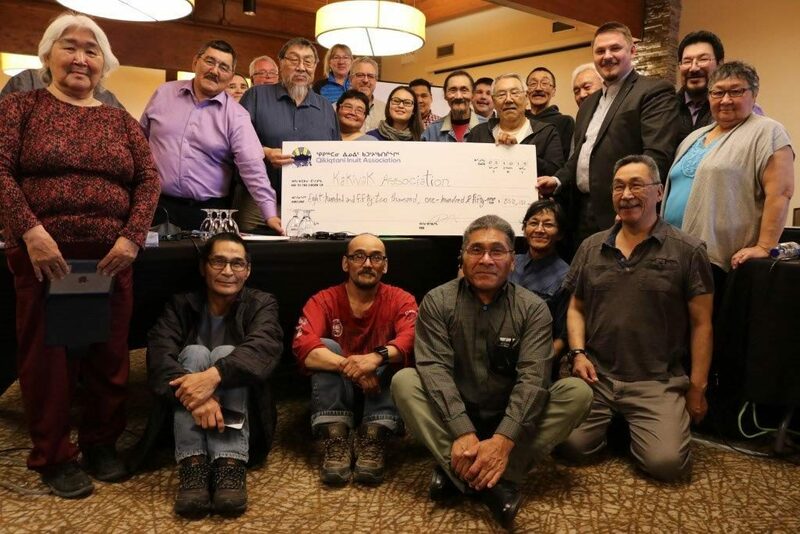 As you know, QIA was renegotiating the Mary River IIBA with Baffinland this year. 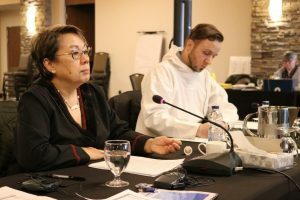 Our negotiations team was led by former Nunavut premier Eva Aariak, who acted as IIBA Chief Negotiator and George Qulaut, who was the advisor. 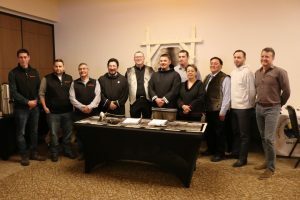 At our meetings, our President had an opportunity to welcome Baffinland Iron Mine’s President and CEO Brian Penney. The two President’s exchanged gifts and spoke to members of the media about the amended Mary River IIBA. 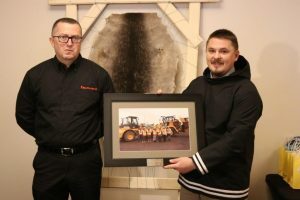 Baffinland’s gift to QIA was a $25,000 donation to Nunavut Arctic College’s Environmental Technology Program Student Fund. 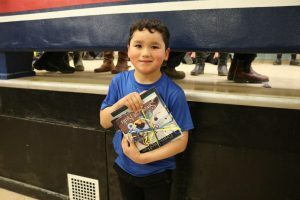 In addition, Baffinland is adding Grise Fiord and Resolute Bay to their community literacy program which previously only included the five Mary River Impacted communities. Our President, P.J. 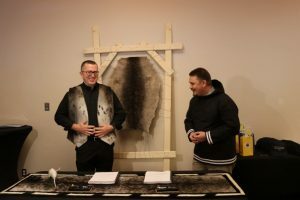 Akeeagok, gifted Brian Penney a sealskin vest, for him to wear when visiting communities in Nunavut. 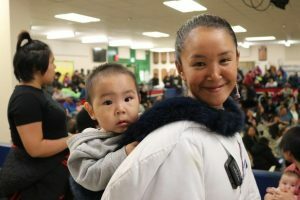 The vest is a symbol of the connection of Inuit to this land. Before starting the IIBA renegotiation QIA conducted a community tour to gather insights on what improvements impacted communities wanted to see. 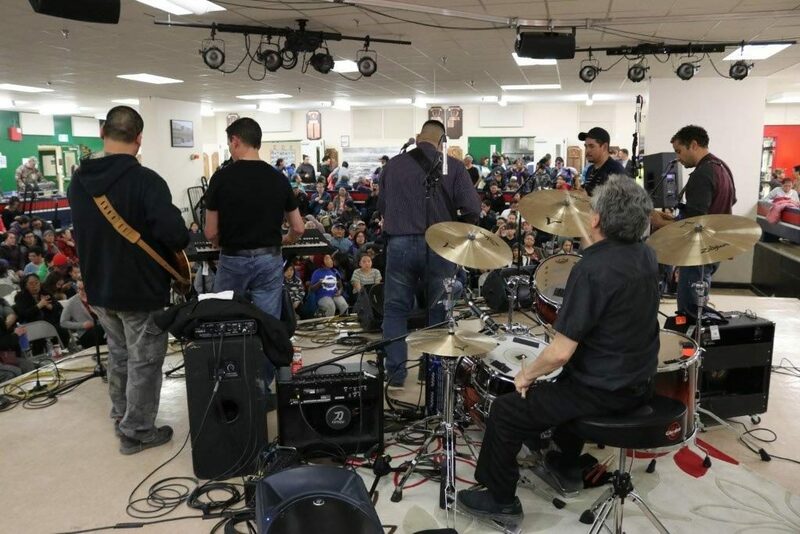 Hamlets, HTOs and the CLARCs were met with in addition to conducting public meetings. 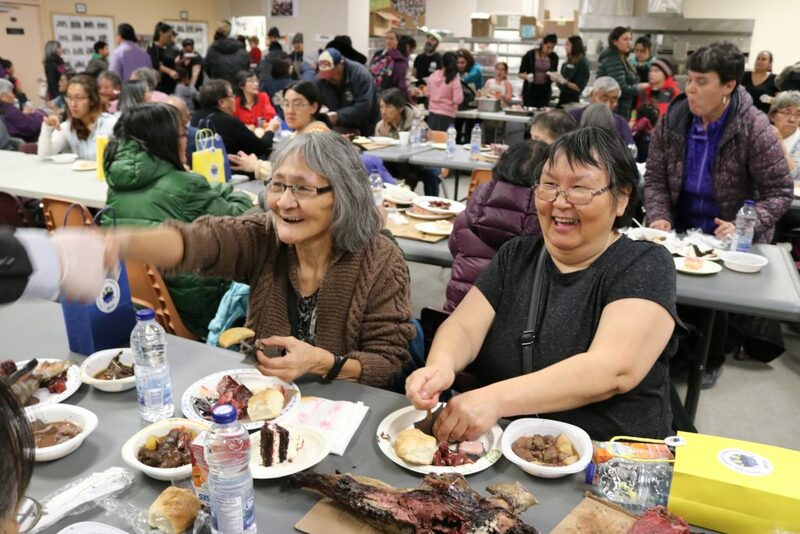 Based on what we heard from the communities, QIA’s goals during the renegotiation focussed predominantly on increased access to training and education opportunities as well as prioritizing equitable Inuit employment. I am pleased to tell you that we have achieved a lot through the renegotiations. We have significantly expanded the Inuit training budget. More details on our achievements through the renegotiation of the Mary River IIBA can be found in our post titled: What QIA accomplished through the Mary River IIBA renegotiation. Meanwhile, our work on increasing employment and training opportunities for Inuit continues. 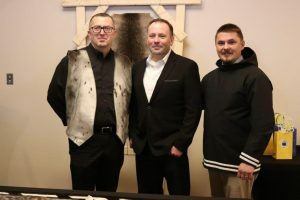 Since we launched the four year Inuit Employment and Training program last fall we have seen tremendous results. We are working well with our partners: the Government of Canada, the Government of Nunavut, Kakivak and Baffinland. Through the Qikiqtani Skills and Training for Employment Partnership (Q-STEP) program we are working on increasing skills development across Qikiqtani. Every few months a new group of graduates complete trainings and internships associated with Q-STEP. 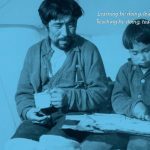 This program is working and serves as an example of what can be done to tangibly improve the lives of Inuit. 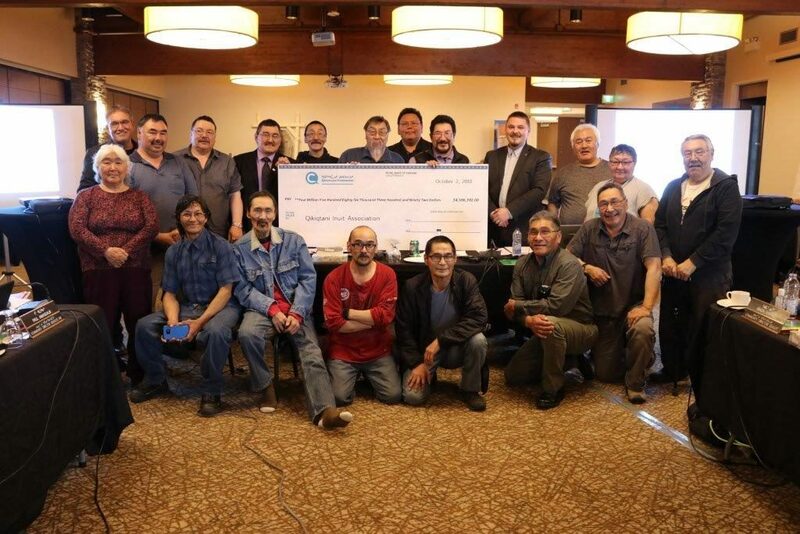 In conjunction with Q-STEP, QIA has designed an Inuit Labour Pool database, Tuttarvik. Tuttarvik acts as a central resource to assist employers in identifying Inuit qualified for jobs or training opportunities in any sector. 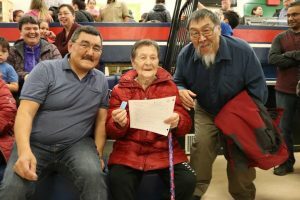 Information and recruitment drives for Tuttarvik have been ongoing in Qikiqtani communities this year. 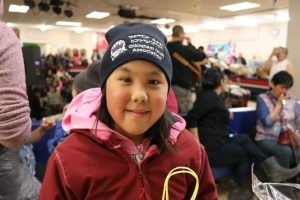 We have over 600 Inuit registered with Tuttarvik to date. The Pond Inlet Community Based Monitoring Project we started last year is also growing. We now have funding through the Indigenous Community-Based Climate Monitoring Program to continue this work for at least two more years. Throughout the past year, six people have participated in the project as community monitors. 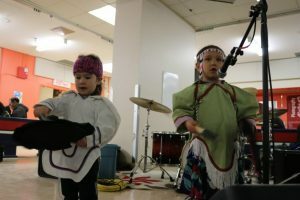 The Qikiqtani Cultural Activities Program funded through the Benefits Fund has grown. We have had two call-outs for proposals one in March and another in May. Every community has submitted at least one successful project proposal. 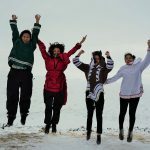 The successful projects range from activities such as hunting and on-the-land trips, to throat singing and printmaking workshops. 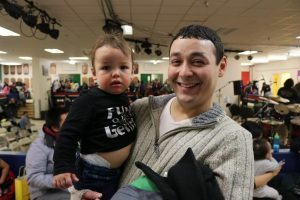 Another program developed through our Benefits Fund is the daycare subsidy. The QIA board increased this subsidy at our May meeting, from $5 to $10. 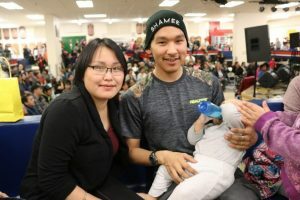 Qikiqtani Inuit parents who are currently receiving Kakivak’s $19/day subsidy now get at additional $10 for a maximum of $29/day of subsidy for daycare. The subsidy will be offered until March 2020 with the possibility of renewal. 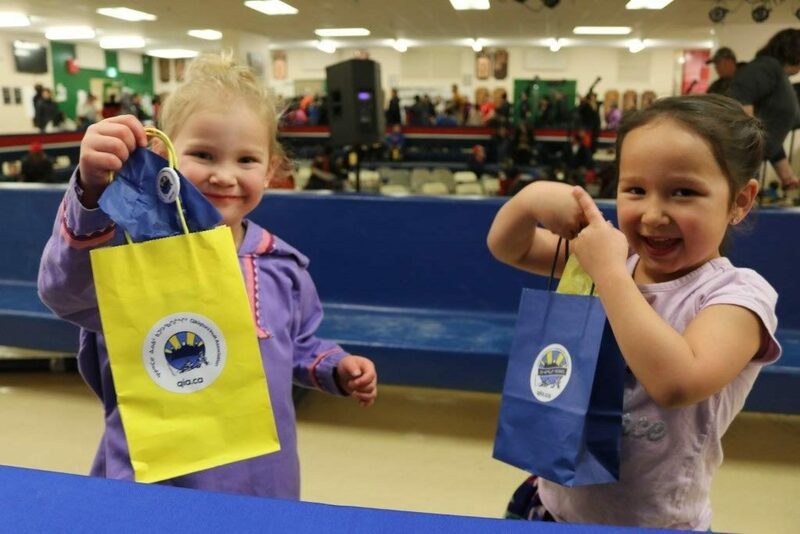 As part of the Benefits Fund programs QIA is creating Inuktitut early learning resources for daycares and families. QIA will launch the new resources in March 2019. The resources will be distributed to all Qikiqtani daycare centres after the conference. In September we announced the recipients for the 80 QIA post-secondary scholarships for the 2018-2019 school year. 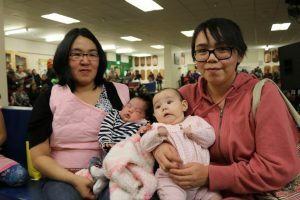 This is the second year we are offering these scholarships to Inuit students in our communities. It is a pleasure to see the responses students have provided to us about how this money has helped them in their studies. 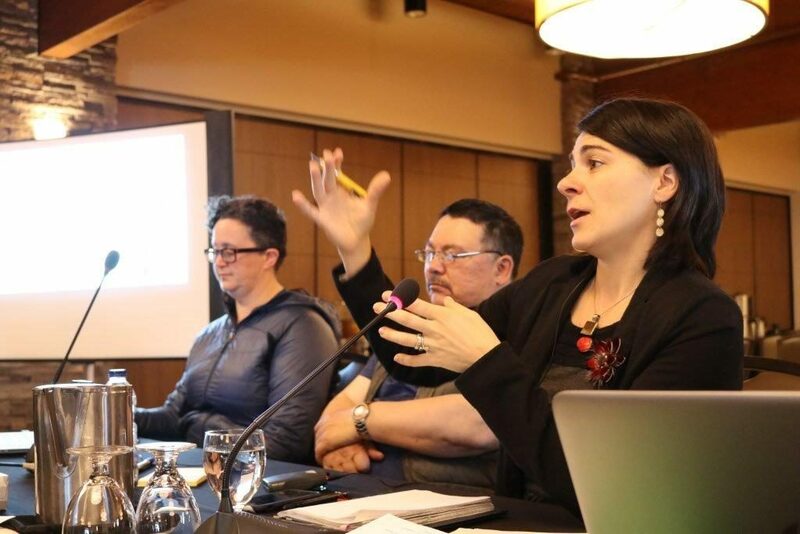 The Ipitiki Program is funded by a $500,000 agreement from Makigiaqta over two fiscal years. 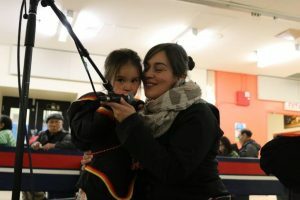 QIA is excited about the Ipitiki Program because it builds capacity for families to support early learning and for Qikiqtani Inuit to deliver early childhood services. We also published our first Benefits Fund and Legacy Fund report this year. These funds are a result of the improved Revenue Policy at QIA. These policies ensure that monies received by QIA are accounted for and handled in a transparent way. Under the Revenue Policy monies received are placed in the QIA Legacy Fund, which is separate from QIA operational accounts. Each year a portion of the money in the QIA Legacy Fund is used to fund programs under the QIA Benefits Fund. As the amount of money grows in the Legacy Fund so to does the amount of spending under the Benefits Fund. 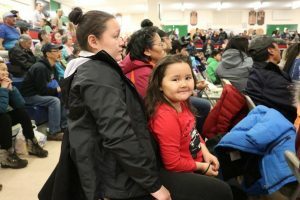 In this way money received by QIA, such as royalty agreements and dividends, are used to support both a long-term goal of sustainable programming for Inuit. 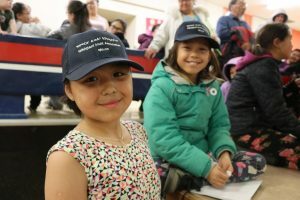 But the money is also used in the short term goal of supporting Inuit today. We are proud that QIA has created a transparent system for managing our revenues. 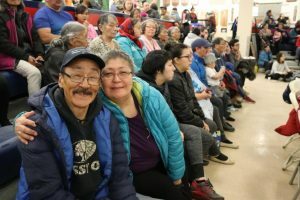 Overtime these policies will allow QIA to directly improve the lives of Inuit. To see a full report of our work this year checkout our annual report – this year it’s more comprehensive than ever before. We can’t wait to see what next year brings us.